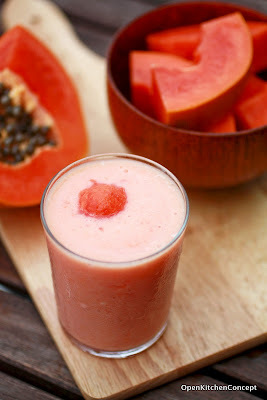 Sometimes, when I end up with a papaya I do not like - either because it's not sweet enough or I've cut it up too soon and it taste too "raw", I'd use the papaya to make a papaya smoothie. Papaya smoothie is probably the easiest smoothie to make. It's basically just papaya with ice, milk and a bit of honey, if you like. You can jazz it up by adding some lime juice or pineapple juice. Papayas are rich sources of antioxidant nutrients such as carotenes, vitamin C and flavonoids. They are also rich in the B vitamins, folate and pantothenic acid. Papayas are also rich in potassium and magnesium and fiber. Most people would, when they think of papayas, think of them as a fruit that helps promote digestive health. Indeed, that's my reason for buying and eating papayas. They are supposed with help lactating women as well, so I supposed I'd be eating papayas and drinking papaya smoothies regularly over the next few months as well. o yes... you will be drinking a lot of papaya juice and papaya soup in the months to come!